Yarny's co-op adventure swings onto Nintendo Switch this March. Unravel Two, the puzzle-platformer from Coldwood Interactive, is officially heading to Switch. Announced during the February Direct, Unravel Two is set to release for Nintendo Switch on March 22nd 2019. If you’ve been yarning for a heartfelt platformer intertwined with lush photo-realistic environments, then look no further than Unravel Two. 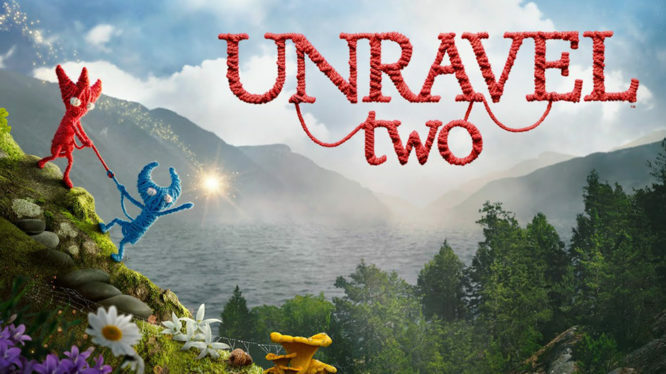 Expanding on the original 2016 title, Unravel Two not only acts as a single-player experience but also sees Yarny buddy up for a drop-in/drop-out co-op adventure. Unravel Two focuses on two Yarnys tied together by a single thread, as they traverse a charming but dangerous world. In single-player mode, both Yarnys are controlled simultaneously, while in local co-op, two players can tackle the many challenges together with a Yarny each. It’s not quite as simple as it sounds though, as cooperation and coordination are vital to survival. Besides the stunning visuals, Unravel Two features a whole host of puzzles ranging from relatively simple to downright devious. By utilising the available yarn, players can build bridges, swing from the treetops, create pulley systems, catapult themselves in the air, move objects, and even act as an anchor for the other player. However, every move comes with a cost, as the very yarn used to navigate the tricky landscapes comes from Yarny’s body. Unravel Two will release for Nintendo Switch on March 22nd 2019. The game has been officially confirmed for a digital release, and if Amazon Italy’s listing is anything to go by, a physical edition may also be on its way.